Local 498 has lost a member. 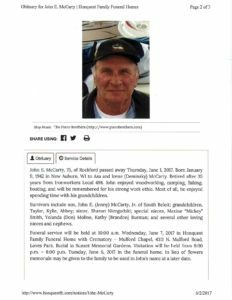 We are sadden to inform you that John McCarty passed away June 1, 2017. He was a 35 year member of Local 498. Our thoughts and prayers go out to the family. The Contract was ratified last night. The body approved a 3 year contract for $3.25,$2.50, and $2.50. The Allocation is $2.04 to the check, .63 to 498 DB, .25 to the Mid America DB, and .33 to the H&W Fund. Thanks to all who participated. Reminder: Meeting tomorrow at 5 pm, a tentative agreement has been reached in our contract. There will be a vote to ratify the contract and allocate. Tonight is vote night at 5pm. Also, if you are interested in working at Beloit’s Alliant Energy project they are requiring OSHA 10 or 30 within past 5 years.We have OSHA 10 scheduled for June 12,13, and 14th 6pm at Hall. Call Penny to get signed up. 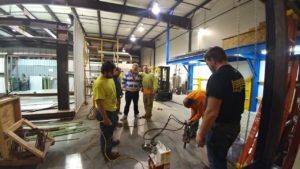 Craig Nenneman and his Post Tensioning Class getting a little hands on training. Chad Barlass, Eduardo Bonilla, John Ruiz, Andrew Seekings, Joe Vincent, and Dan Wilson. Check out the new mezzanine built by one of our apprentice classes. James Dixon, Jared Hobbs, Heath Jansen, Tanner Johnston, and Greg Spain. The instructor for the class was Dean Markee, thanks for designing it and over seeing this apprentice project. Turned out awesome! Thanks also to Painters Local 607 for painting it all up. Next project for next group, removable hand rail and ship ladder. First Aid and CPR will be starting tonight at 6 pm if interested be at hall. Journeyman who need updating are encouraged to attend as well. 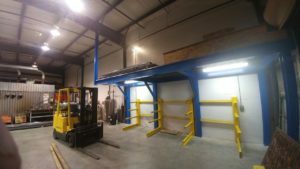 We have expanded our Welding program to include D1.3 Deck Welding in 18,20,and 22 gauge in both painted and galvanized. This will also be implemented into our apprentice program going forward. Contact the Hall if interested. Please be sure to join us tomorrow at the 6:00pm Union meeting. Tom McNamara will be our guest speaker. In case you are not aware, he is running for Rockford Mayor. Weld Test/OSHA 30 coming up. There will be a weld test available March 25th. 7 am start. OSHA 30 will April 1,2,8,9 at our Hall 7 am start. Let Penny or Mark know if you’d like to sign up.